Tap room for Hiver Beers and All Good Beer. Hiver Beers have been around for 5 years now, and the brewing relationship with Hepworth's in Sussex goes from strength to strength. Their tap room has also been around for a couple of years, as has their partnership with All Good Beer, who offer 50+ beers from their bar in the middle of the tap room, including a couple of drafts. 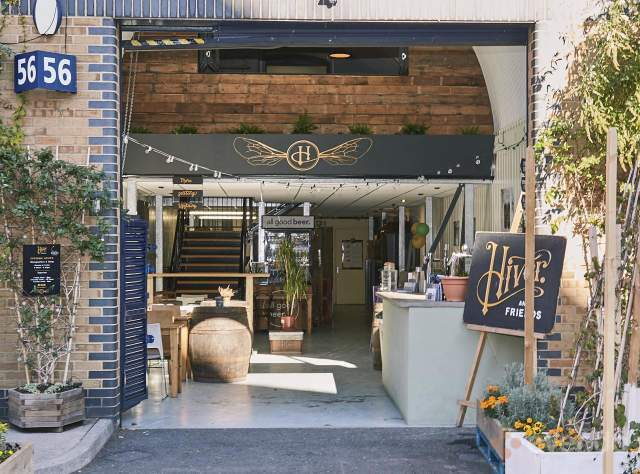 You should always find about 3 of Hiver's honey based beers, plus those from AGB, making another excellent stop in Bermondsey. The hours quoted are the winter hours; in summer they are open from 12 noon on Fridays and into the evenings on Sat & Sun. Card only at the Hiver bar, but cash is good at All Good Beer. Back to the pub search. We are very interested in your news, notes, comments and questions, so please feel free to contact the London Beer Guide.